Even in Groveland — where a convicted felon is suing in court to become mayor and staffers sometimes throw one another out of City Hall in spats over who has the job — they understand the value of Little Free Libraries. Last week, Sentinel reporter Stephen Hudak wrote about a homeowners association in Oviedo’s Bentley Woods development giving a family a bunch of guff over a birdhouse-shaped Little Free Library in the front yard. The association went to the trouble of paying a lawyer to write the Garick family, demanding that they move the box filled with children’s books. Yeah, we can’t have those brats educating themselves. Sigh. What a bunch of uptight ninnies. Some 69 million Americans — roughly 21 percent of the population — live in communities regulated by little Hitlers and their powerful boards. Here’s one homeowner you can count out. Never, ever would the Ritchie Resort and Sunshine Sanitorium even consider locating where some anxious Yankee gets to rule from on high. Fortunately, Groveland has seen enough bizarre goings-on in its time that when Hope Brownlee, 11, marched up to the city manager and politely asked to install a Little Free Library, no undies got bunched in a wad, no Xanax was popped and no property values plummetted from excess reading. Instead, City Manager Mike Hein was impressed. Thrilled. Excited. Awed. Autumn Garick, center, is flanked by her 17-year-old daughter Bryn and husband Bob outside their home in Oviedo's Bentley Woods. 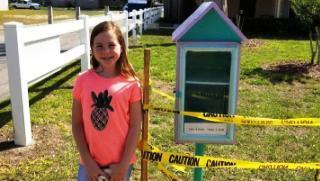 The neighborhood's HOA wants the family to remove the birdhouse-shaped book nook that serves a community book exchange, though neighbors embrace it. Hein said it was “humbling” to watch a sixth grader navigate the bureaucracy of coming before the City Council to ask for permission to put a Little Free Library on city property at the community center. “She grabbed microphone and didn’t stay behind the podium. She talked to them about what she wanted. She gets with the park director, finds volunteer labor and gets material, and the next thing I know, the Puryear Building gets a library,” he marveled. Let’s pause here for a moment. Folks who consider homeowner associations as hallowed guardians of property values will argue that Hope went through the proper channels and asked to erect a little library, and the Garicks didn’t. Remember, however, that the Garicks own the property where they took down the little library after the fuss — even though they replaced it with a bigger one. Hahaha. Those folks have a sense of humor. Some things just don’t need regulating, and little libraries are one. Sense! Common sense! Somebody grab it and smear it on homeowners associations everywhere. Hope has an “empathetic heart,” said her grandmother Julie Fielding with whom she and her mother have lived since Hope was only 2 weeks old. It shows in the other projects she’s done, Fielding said. Hope has collected crayons from restaurants, melted them into “fun molds” and donated them to the pediatric unit at Florida Hospital Waterman in Tavares. She made bags at Christmastime for the homeless, saving her birthday money for two months to buy toiletries to fill them. She volunteers on Friday nights at the Plaster Cottage to help younger crafters create plaster projects. A kind neighbor helped Hope with the tough parts on the little library, which she made from an upcycled file cabinet. One shelf has children’s books, the other adult books. Hope said she went to the council meeting and just told her story. She helped dig a hole and mix the Quikrete cement to hold the post in place. Nearly every morning on the way to Gray Middle School, she checks the box to see whether anyone has borrowed any tomes. “We had a million jillion books at our house, so we put some in it, and when we came back the next day, people had already taken some and left 14 new books in there,” Hope reported. She said that the shelf of children’s books is the busiest, and she’s tickled that kids are using it. “Now it’s just standing out there, brightening everything up,” she chirruped. And so are you, Hope Brownlee. So are you.